Many of our customers, especially when they get in touch the first times, ask themselves the reason why we chose this name. Answer is actually simple, even if a bit difficult.. to pronounce. Polypro’ is born with the unique and exclusive purpose to create point of sale displays from corrugated polypropylene sheets. This is where our name comes from: from the grass-roots raw material we realize our displays with. The majority of point of sale displays is still made in cardboard, even if this causes several troubles to customers: they rip up, come unglued and collapse. And we can’t forget the complete lack of resistance to water and humidity: after all it is paper (actually mostly made by adhesive and chemical substances, with small parts of cellulose) and that’s no surprise. Cardboard is not the best support to realize a point of sale display. It was certainly the best one 30 years ago, when it was the only option. Today it is not anymore. Honestly cardboard seems difficult to replace, especially because it is cheap and easy to work. Main production processes, printing and cutting (die-cutting), allow to briefly produce even big quantities. But, even if realized in plastic material this is exactly the main advantage of our displays: production processes are basically the same – therefore equally cheap: printing and die cutting. It is not requested neither expensive moulds nor masters. This is the reason why corrugated PP is the most appropriate raw material to realize promotional displays. Cardboard is old-fashioned. What are we using (polypropylene sheets) to produce point of sale displays, is different from what is used in other manufacturing areas. Structure, chemical composition and additives have been developed and tested to create displays that are light, resistant and of high visual impact. A perfect mix for sales. Indeed, in the market there are “durable” displays made either in wood or in metal, or even in other plastic materials, but they all need expensive manufacturing processes, therefore they don’t fit for the purpose. Furthermore both metal, and especially wood, if not properly treated with specific and expensive operations, are easily vulnerable to liquids, mildews, bacteria and oxidative factors. But got here, as they say, it’s not worth the trouble anymore. Even if cost of one of our polypropylene displays is higher than a cardboard display’s, its durability at the point of sale is usually 10 times longer than paper ones. Therefore, to calculate how much your company can save, thanks to the ongoing usage of our displays is simple. We do not sell to private citizens or individual shops: our clients are companies who produce and distribute their products into stores, both supermarkets and specialized shops. They are not appropriate, if you are using disposable displays for short-term promotions. Unless you need resistance to weight or to specific environmental conditions (for example you place them outside, on wet floors, you have to follow specific hygienic restrictions, etc.). They are not appropriate, if you see a point of sale display as a merely logistic aspect – we have to be there – and your company and products image is a useless and unimportant aspect. If instead you are tired of wasting your money in ongoing replacements of broken, collapsed or dirty displays, contact us now. They are not appropriate, if being specialized, reliable and offering a complete warranty on the supply, means nothing to you. We produce exclusively polypropylene displays, cooperating with small and big companies worldwide and we offer even three warranties on our products (yes, I know, there is no other company worldwide in our business area who does). But who is behind Polypro’ ? 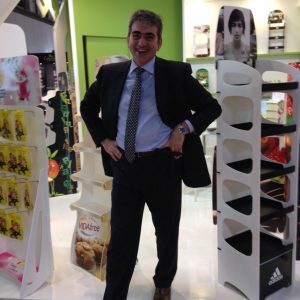 Giuseppe Tripodi, creator of innovative expository solutions in polypropylene, he has been designing and producing point of sale displays for 23 years. Grown up in his parents’ company, once he finished his studies in Law, he committed himself to full time development of his companies. International patents owner – all of them referring to polypropylene displays – he succeeded in creating a new world-wide product category: corrugated polypropylene displays. The first in Europe to employ offset printing with oxidative inks (for food) on large-format printing machineries. He is not a designer, but his creations are particularly appreciated both thanks to technical innovation and to high visual impact. Among his works stand out the creation and realization of displays part of Beiersdorf – NIVEA “Jewel” campaign (approximately 200.000 floor displays produced in just over two years) and Ferrero S.p.A. chocolate praline seasonal reintroduction activities (more than 1.750.000 counter displays produced in 3 years). Passionate about marketing and technology, he deeply knows point of sale dynamics as well as consumers purchasing processes’, and he puts his knowledge to creation and realization of Polypro’ displays. Nowadays he takes care of Polypro S.p.A. business development, for which he is in charge of client acquisition and products design.